1In a small bowl, thoroughly combine mayonnaise, blue cheese, sour cream, lemon juice and Rub Some Steak. Cover with plastic wrap and refrigerate until ready to serve. 1Preheat a gas or charcoal grill to medium heat (approx. 375°F). 2In a large bowl, toss chicken wings with the Rub Some Steak. 3Oil a clean kitchen towel and use tongs to coat the hot grill grate with oil. 4Use tongs to place the chicken wings on the hot grill grate. Cook the chicken wings, covered, turning every 2-3 minutes for approximately 20 minutes, until internal temperature reaches 165°F. 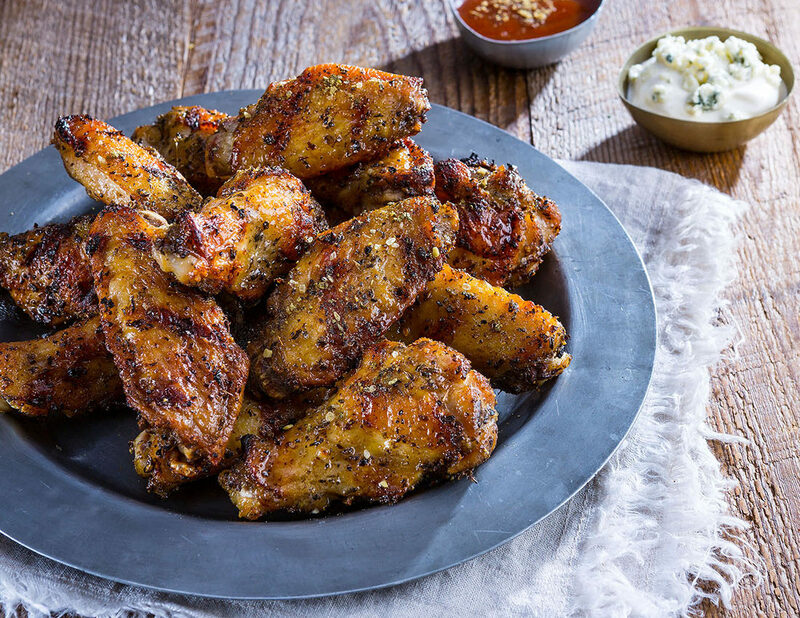 5Serve the chicken wings with the blue cheese dipping sauce. Use 1 tablespoon Rub Some Steak per 1 pound of chicken wings. Add a few drops of hot sauce to the blue cheese dipping sauce for a little spice. Carrot and celery sticks are the perfect accompaniment to these tasty wings.